When you initially talk to one of our patient specialists, we set you up in our system and have you fill out an extended health record on our electronic medical records system: Power2Patient. This is lengthy, but we are able to pull vital information from this in making sure your initial consultation with the physician is productive. Along with this health record, we request an integrative lab panel. We work with a lab with special pricing in getting these done and they are drawn in office. We can give you a list of requested initial labs we need to have drawn if you want to go elsewhere for them, but we warn that often not everything requested is drawn for at other labs. There are some tests unique to the lab we use. If you do not have all the labs requested, we have to move that initial appointment until we have them all. Once the labs are in and requested health information is completed, we set you up with our physician! Labs typically take 48 hours to come in from the time they’re drawn so this can be done quickly! Your initial visit with the physician lasts approximately two hours. It is not your typical doctor’s visit where you’re in a white room with medical devices surrounding you. We have a relaxing setting where you and the doctor discuss your overall health goals and how they will be reached. Patient’s actually note this initial visit as fun (yes, FUN.. a doctor’s appointment!) because you learn the why’s behind your health issues and you have a physician who is sitting down and LISTENING to your concerns while finding a solution instead of looking to mask it. Since no two patients are alike, we cannot tell you everything that comes out of this appointment besides you will leave with new information centered around your health and wellness and a plan to optimize your health. Who is this appointment perfect for? Anyone looking to optimize their health! We have patients who come to us for such a broad spectrum of reasons. Some are already healthy but want to know more about their body and how to ensure they live their healthiest life. Others have major health problems they have been battling with all their lives and want to see what they can do to help in a more natural, holistic way. When you set up your appointment for one of our spa treatments, we set you up in our Power2Patient EMR system. You will fill out basic information online making note of any allergies or specific health issues we need to be aware of. During your initial appointment, we do a skin assessment and listen to your skincare goals. We then perform your specific facial or laser treatment. Some laser treatments we have to first do a “tester area” to make sure your skin reacts well to it before doing a full series. 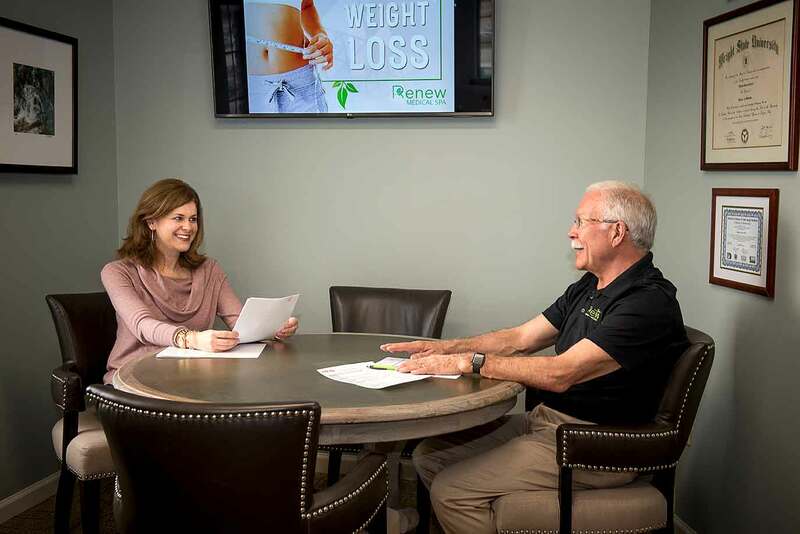 Copyright © 2019 Renew Medical Spa Huntsville. All rights reserved.